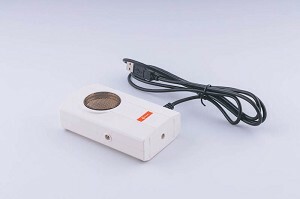 The €Motion is an ultrasonic motion detector that connects directly to a computer through a USB-port. No additional interface or adapter is needed. The €Motion measures continuously the distance between the interface and an object. The minimum range of the €Motion is 0.2 m. The maximum of the range is 6 to 10 m, depending on the size, shape, orientation and surface of the object that is detected. €Motion can be combined with €Lab for many kinematics experiments. More technical specifications about €Motion can be found in its User's Guide. For displaying and analyzing the data collected by €Motion on the computer the Coach 7 and Coach 7 Lite software is needed.